The Housing Conservation District Review Committee met on Monday. They voted to allow the demolition of three public housing complexes, and passed the buck on a fourth. These decisions dominated the local news. But there were some other items on the HCDRC’s agenda. I wrote about the ongoing dispute between my neighborhood organization and Victory Real Estate Investments last week. 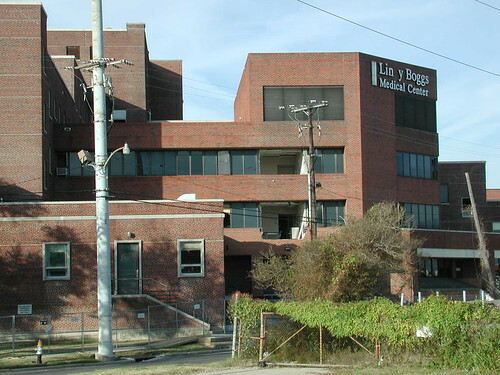 Victory’s request to demolish the defunct Lindy Boggs hospital was on the agenda again Monday. You’ll recall that Victory made this same request just after Thanksgiving. At that time, the decision was deferred so that Victory could meet with the community. We wanted a 30-day deferral, but Victory said that would cause a financial hardship, so a two week deferral was granted. But, we were warned, no more deferrals would be allowed! Apparently two weeks wasn’t enough. Between that hearing and this one, Mid-City and other neighborhood organizations lobbied our council members and state reps to get Victory to the table. That didn’t happen. Victory has not returned our phone calls or communicated with us in any way. Then, at the HCDRC meeting on Monday, Victory requested another two-week deferral to allow time “to work with Dr. Blakely’s office on redevelopment plans.” One HCDRC member requested that those discussions include the neighborhood. Following Victory’s request for a deferral, Jennifer Weishaupt spoke on behalf of Mid-City. She asked the committee to vote to deny the demolition request, which would compel Victory to appeal to the City Council. The HCDRC voted 4-2 to grant them their deferral. What happened to “no more deferrals”? What happened to the “financial hardship” that Victory was worried about? Now the demolition will be on the next HCDRC agenda, probably in January. 01:28 Stephanie Bruno, HCDRC member, poses question to Mr. Cortizas [Victory’s lawyer] regarding HCDRC’s deferral of 11/26 being specifically for the purpose of meeting with the neighborhood. She asks whether he was contacted and pushes him to answer a yes/no question about whether he responded to our requests. 02:00 Mr. Cortizas responds to Ms. Bruno. They were demolishing part of it today. It’s going to get a much more receptive hearing in the City Council Chambers than they are in the HCDRC. Can you name one council member who is going to put the damaged state of a hospital that isn’t going to be a hospital anymore above the potential jobs and tax revenue that is going to come with this development. Plus a chance to clean up some damaged warehouses in an industrial area? If you don’t find development inherently evil the prospect that your constituents are going to get a brand new place to shop and get jobs and all of the tax revenue which will be flowing out of the place which aren’t flowing out of it now… It’s a mighty big “get” for a politician even if they can put up with the static from the opponents now. And let’s be honest. Unless they get retailers completely out of step with the neighborhood, the people opposing them will be shopping there. If it happens, I’ll be pissed, and then I have to decide, if I really want to go to Target, do I boycott the one they put up in Mid City, or do I go to Dukeville and spend money in JP, which I typically try not to do? The point is that Victory has jerked the neighborhood around for months. They’ve lied, they’ve obfuscated, they’ve danced around basic questions. Not exactly acting in good faith. Regardless of your position on the demolition, there is a process that is supposed to be followed, and that process requires that demolition applications include redevelopment plans. Why on earth should the City Council let a big-time developer off the hook? We all know that they have some kind of a plan -they’re just hiding it.